A water-filled basement is one type of nightmare! A basement with a sewer or septic backup is the worst nightmare anyone can experience! Not only is it inconvenient, but the health risk and property damage are also major. When this happens, you need a professional who can be there fast and get the job done right! At a time like this, you need Done Right Carpet & Restoration, Inc. to handle your sewer back up and sewer line break problems! We are the professionals who have been around for 20 years, have been there before, and know exactly what to do. Not only do we have the equipment to remove the sewage, we also have the disinfectants, chemicals, and training to make the affected area safe once more for you and your family. 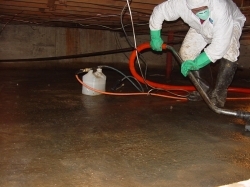 Sewage removal is a dangerous process due to the toxic microbes that may be present in raw sewage waste. You always need to have experienced sewage damage contractors with specific equipment that keep you and your family safe during the sewage cleanup process. Our goal for our commercial and residential customers is to restore your home or business following a sewage damage disaster in order to limit downtime and expense. Sewage damage can be the most unhealthy damage you can have. We will be there until the entire project is complete. If your sewer or septic system is giving you problems, call us. Done Right Carpet & Restoration, Inc. will do the job quickly and professionally.